Every year, I love making homemade gifts to give out during the Christmas season. It seems that the last few years have only brought more to do, so every single year I tell myself no more homemade gifts. And every single year I end up making them. There is just something so special about giving a gift made with love and care for your friends and family – especially when it tastes delicious! So this year, instead of talking myself out of making yummy treats, I decided to change my method. 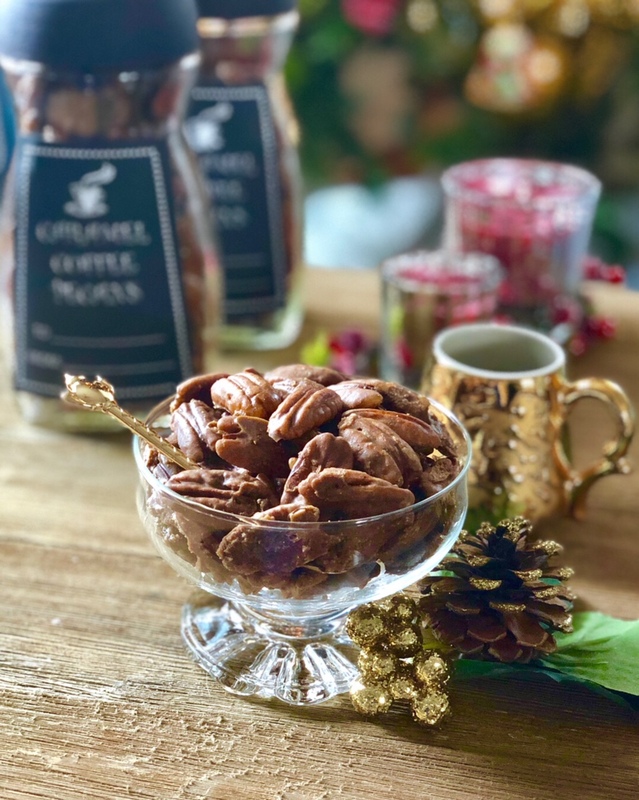 In lieu of making confections that are time-consuming, I am sticking to a few quick tried and true recipes, like these super EASY CARAMEL COFFEE PECANS. You guys – these are seriously addictively delicious. They originated from a recipe I’ve adapted over the years out of my vintage 1966 Better Homes and Gardens Cookies and Candies Cookbook. They do not disappoint! In fact, along with my chocolate toffee cracker candy, they are gone soooo fast! I love saving old Nescafe Instant Coffee jars because they make the perfect reusable gift jar – and because we have like a million of them since coffee is a major addiction in our household (you have to have some vice, right?) This year, I created a fun template that fits right on the jar. They can be printed and fixed to the jar with double sticky tape, or printed out on LABEL PAPER for super easy placement. A fine point WHITE SHARPIE is perfect to fill in the To and From sections. Click HERE to get the free printable template. Don’t have leftover coffee jars? Get yours HERE and pour the coffee into an airtight baggie until ready to use. 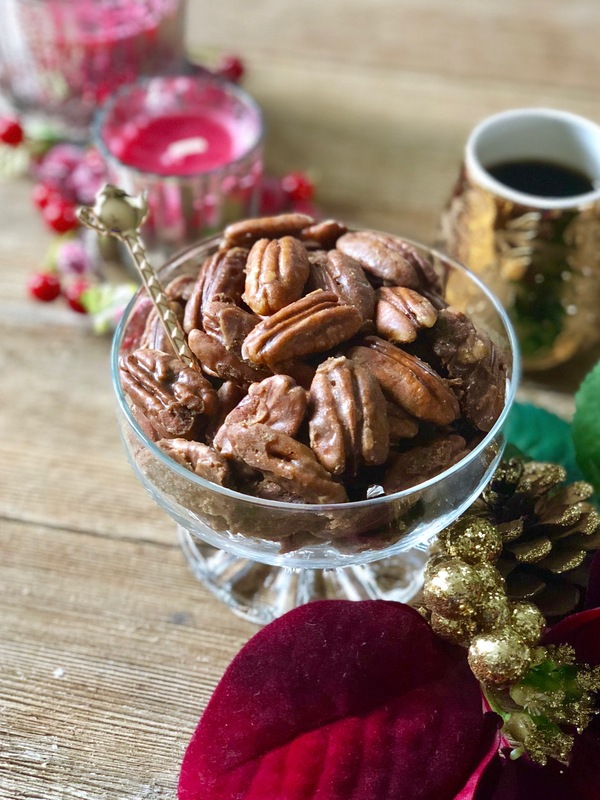 While this recipe isn’t the most sugar-free thing in the world, I love that the pecans help them shine above most candy. 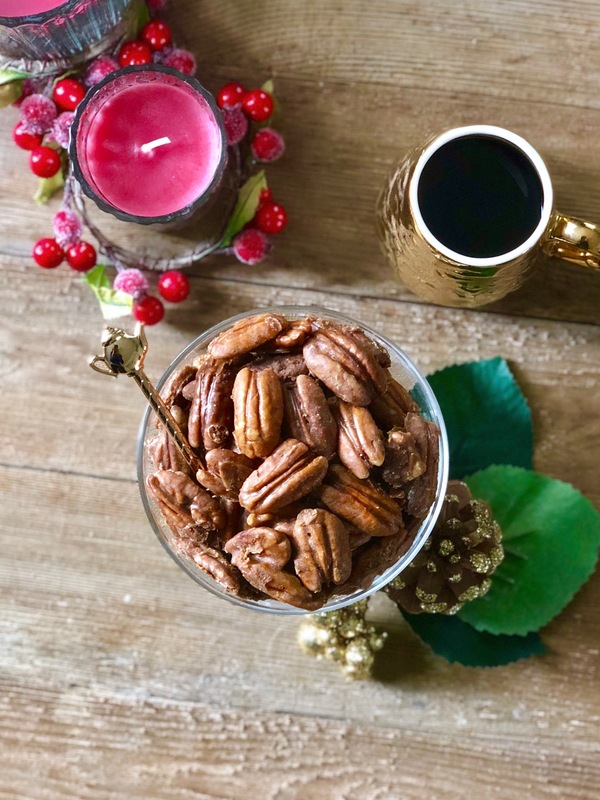 Pecans are loaded with more than 19 vitamins, healthy unsaturated fat, immune-boosting antioxidants and 10 percent of your daily fiber. One could even argue that a pecan might be able to replace your daily multivitamin. If I am going to indulge in something during the holiday season, having a little healthy bonus in the mix never hurts! 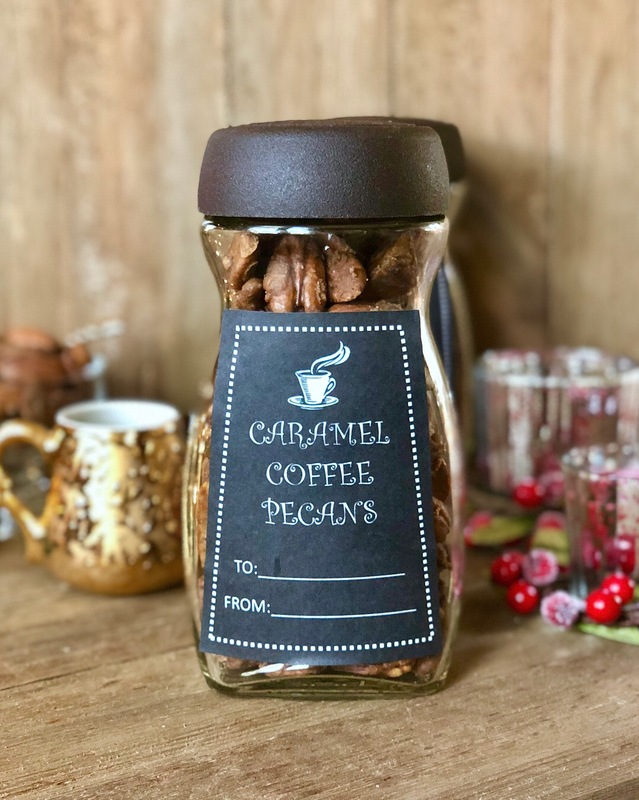 Easy Caramel Coffee Pecans - with FREE Printable Label Template! Looking for the perfect, easy homemade gift for the coffee lovers in your life? This delicious caramel coffee candy recipe will be the talk of Christmas for years to come! Bring sugar, sour cream and coffee to a boil. Heat to soft ball stage or 236 degrees F. Remove from heat. Add vanilla and pecans, stirring to coat pecans well. Turn pecans out on a surface coated with a non-stick baking mat or parchment paper, avoiding too much leftover syrup from draining onto the surface with pecans. Separate pecans apart with two forks into a flat layer. Let dry completely, approx 4-6 hours. Store in an airtight container in the fridge once they have dried. Enjoy! Try not to spread too much syrup on the non-stick surface with pecans or it may significantly increase drying time. I like to give them plenty of space and air to dry for best results. PIN THIS RECIPE FOR LATER!! This post may contain affiliate links which are no cost to you and help offset the expenses of running this blog. All products are pre-tested and approved by This Season’s Table. Thank you for your support! Looks fabulous. Will have to try this. Thanks Gina! I hope you enjoy them!! It’s one of my favorite new DIY Christmas treats! My father in law would LOVE these! I might have to make a batch for our Christmas Eve Brunch! I am drooling over these!! I LOVE the idea of realizing old Nescafé jars! That’s so perfect! These look wonderful and I’m sure anyone would be thrilled to get these as a gift!